ADDITIONAL CONTEST RULES FOR THE “IT’S ALL FUN AND GAME GIVEAWAY WITH CLASSIC HITS 93-3 AND FAST SIGNS! 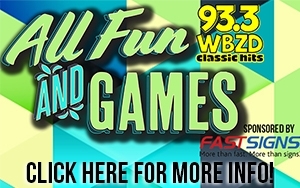 A SAMPLE TRACK OF THE SOUNDS OF FUN AND GAMES CAN BE HEARD AT WBZD.COM. 2. REGISTER TO WIN AT AN OFFICIAL REGISTRATION LOCATION. LISTEN TO 93.3 FM OR VISIT WBZD.COM FOR LOCATIONS. 4. 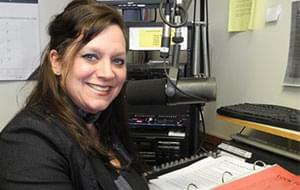 BECOME A MEMBER OF CLASSIC HIT’S 93.3 LISTENER CLUB. GET ALL THE DETAILS AT CLUB.WBZD.COM. WE’LL DO ONE OR MORE RANDOM DRAWING(S) FROM ALL CLUB MEMBERS. –A RE-FURBISHED VALLEY 7 FOOT POOL TABLE, A MEGA TOUCH COUNTER TOP VIDEO CONSOLE WITH OVER 60 GAMES, AND FOOSBALL TABLE! ALL FROM FAST SIGNS, MORE THAN FAST, MORE THAN SIGNS, FAST SIGNS! OR MAYBE WIN OUR SECOND CHANCE CONSOLATION PRIZE, $3000 OF GRANITE OR MARBLE COUNTER TOPS FROM C & S GRANITE AND MARBLE! *ADDITIONAL PRIZES MAY BE ADDED. PRIZES MAY CHANGE OR BE DELETED. THE WINNER IS RESPONSIBLE FOR ALL LOCAL, STATE, FEDERAL TAXES, TITLES, TAGS AND REGISTRATION FEES THAT MAY BE REQUIRED. SEE #11 ON OFFICIAL CONTEST RULES FOR ADDITIONAL INFORMATION THAT WILL BE NEEDED FROM THE WINNER. NO PURCHASE NECESSARY. YOU MUST BE AT LEAST 21 YEARS OF AGE WITH A GOVERNMENT ISSUED PHOTO I.D. FOR MORE INFO CHECK US OUT ONLINE AT WBZD.COM.